Melinda Mattson - The Blog: Genevieve Georget: Isn't She Lovely? Genevieve Georget: Isn't She Lovely? You all know how finding wonderfully crafted sentences can make my entire day and how reading beautifully chosen cadence weaves this lovely tapestry before me. It's something I want to wrap around my shoulders while I sip my tea. Well that happened last week with my new friend Genevieve Georget. Okay, we're not exactly friends nor have we ever met or had any kind of correspondence, but she feels like a friend to me. I immediately wanted to share her with all of you. The post that introduced me to her was one she had originally published a few years ago, but recently shared again on Facebook. I had never heard of her before, but found her words in my newsfeed and I liked her immediately. So did a whole bunch of other people...as in tens of millions of people! Maybe I don't really need to make an introduction after all since you've likely already heard of her and feel like you have already been introduced. I read that she, a successful wedding photographer in Ottawa, just wanted to dip her toe into writing again and then, much to her great surprise, the words she shared took rocket speed flight. Her post kind of broke Facebook for a few days. The Zuckerberg people actually contacted her and asked if she was a celebrity pretending to be someone else. The explosive growth of her page made no sense to them because regular people don't typically garner that kind of attention in one week. Though she's not a celebrity, there's nothing regular at all about this gem of a girl or her gorgeous gift with words. Her post was an essay about a visit to Starbucks that was everything routine and yet so much more. She wrote of how her dear barista called her life golden when she heard she and her husband were on their way to Italy for a getaway. And it wasn't spoken with any malicious intent or sarcastic banter, the girl really thought Genevieve's life deserved a gold star. She wrote of how she greeted this girl for her daily coffee in great clothes on her way to an exciting and fulfilling job, and how on that particular day on her way to a European vacation, her life did seem pretty sparkly. "This is what she saw. Therefore, this is what she knew." "And truth be told, there is darkness in this kind of knowledge. Especially now, when so many of our connections happen only five minutes at a time…fully filtered and perfectly hash tagged. In our defense though, it’s not entirely our fault. That battle we’re fighting…those rough days were having…they don’t tend to translate very well when you have twenty people in line behind you for coffee or a hundred and forty characters to spell out your day." 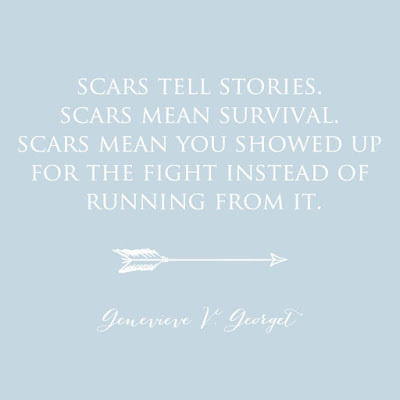 We don't show most people our battle scars and wounds, certainly not when we are still raw and healing. It's become a bit trendy to share vulnerabilities or struggles with the world, but only once they are tidied up and mended. Though still valuable, this type of sharing can feel more akin to a successful spot removal tutorial rather than a compelling narrative with the spill still in full view.. Rare is the public post that highlights the unedited version of us where we're still blotting things up. Yet there's something so lovely about this type of unveiling where we let others in as we're still tidying up. But Genevieve let us see her. She gathered her list of real time loss, fears, and insecurities and typed it all out for everyone to see. She went on to share the wisdom she's gathered through reflection on the less glistening parts of herself. How she's learning that these are actually the golden parts, the shiniest parts after all. And how even when she doesn't have it all figured out, she's grateful for the entire picture of her life, not just the polished parts. "I do know one thing for sure; that even with all of my frailty…all of my fears…and all my faults…none of those things make my life any less golden. And we’ve all got them…even the sweet girl serving my coffee. She’s fighting her own battle…defending her own frontline…struggling in her own way. And maybe it’s not about collecting gold stars for the perceived reality we give the world on Facebook…but it’s about the purple hearts we get for living bravely among the real one. Because life requires guts…it requires bravery…and it requires vulnerability." So I don't really know Genevieve Georget, but I sure find her lovely. I like her so much already and would love to sit across from her with a steaming cup and open heart. Her words feel like a soft blanket on a chilly day. Her voice makes me feel like she's pulled up a chair next to me and whispered, "Me too." I love that her unfiltered words were the ones the world carried into viral stratospheres. The internet is full of crazy, and sometimes it's impossible to understand why certain phenomenons and tidbits are so crowd-pleasing. But this one I understand and it encourages me greatly. This lovely girl was simply herself in bold braveness and half of the sky took notice and said, "Yes, more please!" I love how it baffled Facebook and they just couldn't imagine why millions of people were sharing her post if she was just one of us. But that's precisely why her words took flight. 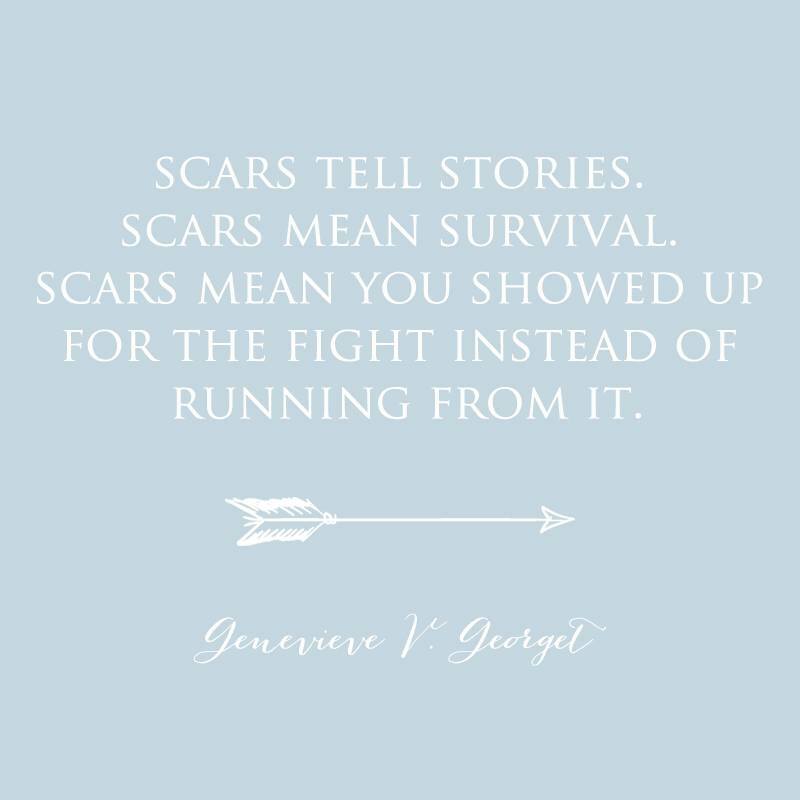 When she told us about her battles and wounds and we got to see that she is still standing, it inspired the bravery in all of us to stay in the ring and fight the good fight. So I'll keep leaning in to listen to the words she shares and will keep writing and sharing. I'll share with even more bravery from my own little perch because of the shiny trail she's blazed before me.